Crushed digestive biscuits and mix well with melted butter. Press into a 8” tin. Refrigerate for later use. Put all the ingredients into a pot. Boil over small fire until gelatine is dissolved. Boil all ingredients until dissolved. Pour marshmallow filling into the prepared baking tin with biscuit base. Put in freezer until slightly harden but not totally frozen. Take it out and arrange sliced fresh strawberries. Put it back to freezer to harden a little. When slightly harden take it out and pour the slightly cool or cool Jello on it. Put in fridge to chill. Cut into small pieces to serve. Optional: You can also arrange some sliced fresh strawberries on the biscuit base just before pouring in the marshmallow filling. leelee r u talkin abt 1/2 a pack of the 4serve size jello or the 8serve size? There is only 1 size pack from NTUC where I get my jello. I need to check how many grams per pack and revert ok. Thanks for the wonderful recipe. I made it on Monday for my gathering on Tuesday and it was a hit. The only problem I faced was when I scouped in the jello spoon by spoon onto th mixture, my strawberries started to 'swim' around. Could it be that I spooned in too much at one go? 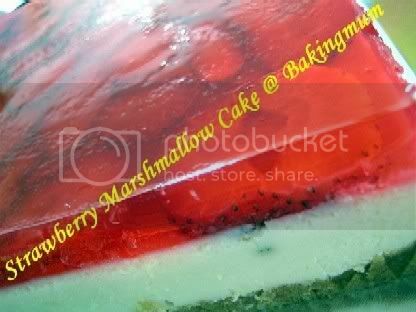 Hi nicky, to avoid your strawberry from floating, you can actually place the strawberry on a not too frozen marshmallow layer and leave the whole cake into the freezer to get it slightly frozen before you spoon in the jello layer. hi, i chance upon this blog of urs and i must say I am so happy to find so many recipes! I would like to try this recipe of yours but may I know where to find the Jello? I have been to NTUC but I cant find it. Is it just any agar agar or jelly powder? hi i have been to NTUC but i cant find the jello. May i know if it is a brand name or can I jsut buy the normal agar agar powder or jelly powder? Get from NTUC this brand call "Tortally" jelly crystals. It comes in a few flavours. 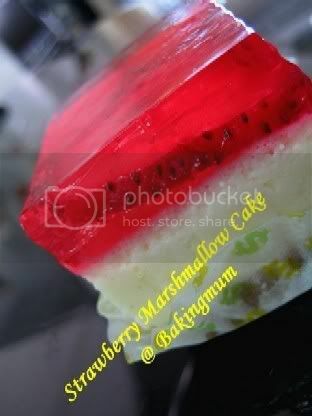 This is my first trial at making the marshmallow strawberry cake. 1. You mentioned that the marshmallow mixture should be boiled until the gelatine is dissolved. Should the marshmallow be fully dissolved during the boiling also? 2. The marshmallow mixture seems to be quite watery. Should this be the case? (The liquid mixture seems to sip into my biscuit base). 3. When I cut the cake into pieces for serving, I realise that the Jello topping does not stick to the marshmallow layer. How do I overcome this? I am sorry to trouble you with my problems. Grateful for your advice. Thanks. Hi j, the marshmallow should be all dissolved in the process of melting the gelatine with the milk. The mixture is not thick but if you use the amount stated in my recipe it should gives you a pouring constitency. Remember to freeze well the biscuit base before pouring in the marshmallow mixture. I suspect you did not freeze the biscuit layer well enough thus causing the marshmallow to sip through. Taste really good! A bit like vanilla ice-cream cake. What's the trick to cut it neatly? the marshmallow layer will smudge the side of the jello layer when I lift the knife up. what tin did you use? Springform? If normal tin, how do you lift the cake out? When cutting the cake, make sure after every cut, you wipe the knife with kitchen towel/tissue. Use a sawing movement when cutting the jelly portion, then press the knife down with both hands on both side of the knife (use a longer knife to cut). Almost everytime, it will give you a smooth cut. Don't be lazy, wipe the knife after every cut. I used a cake ring. It has no bottom. I used clingwrap to wrap the bottom tightly and place it on a cake board. When removing, just slide a knife along the sides and lift up the cake ring. Just made this. It's nice. I use 7" and the jelly not as high as yours, Lee Lee. Maybe will double the jello topping. Thanks, Lee Lee for this wonderful recipe. Hi Sophia, thanks for letting me know that you like this cake. Yah, by all means, you can double the jelly if you like it thicker/higher. Really like yr blog. Very organised blog, easy to read and plenty of delicious pictures! Like the comments at end of page...find many useful tips. Look forward to seeing more wonderful reipes posting from u! Yr 2 boys are so fortunate to hv a baking mum! Hi Anonymous, thanks for visiting my blog. Cooking and baking is my hobby. I will try to post simple and easy to cook recipes when I come across them. Most of the time I don't really have an exact recipe. It's all by estimation and taste-as-you-cook in adjusting the seasoning. I used fresh milk instead of UHT milk, will there be a difference in this? Noticed that the marshmallow just won't harden (though I thought it had and poured the jelly over). Now the marshmallow was mixed with the jelly. Normally how long must I chilled the marshmallow before I can pour the jelly over? Any rough guide? Actually it don't really matter whether UHT or fresh milk is being used. With the gelatine used, you should be able to harden the marshmallow layer. You can add slightly more gelatine if you are afraid it will not harden. Maybe add 1 tsp more. Normally, you can put the marshmallow layer in the freezer for about 30 mins to 45 mins. As long as you feel the surface of the marshmallow is harden enough for you to slowly spoon the jelly layer over it and it will not break will be good. HTH. tried yesterday but found that the marshmallow part form 2 layers , bottim one look firm but top is form..what happened? i tried this today in cupcakes form~ yummy and not sweet =) but i dont taste much marshmellows.. one question, after the marshmellow mixture is done, there's a lot of bubbles on top..makes it very difficult to spoon into cups as some too bubbly and some too liquidy. is it supposed to happen? Anonymous, you may have stirred very hard during the melting process of the gelatine and marshmallow causing it to have lots of foams. You can try sieving the mixture before pouring into the biscuit layer. Hi Shan, if you like you can always increase the amount of marshmallow used. Try using a sieve when you pour the marshmallow mixture in. This will get rid of the bubbles. Made sure the marshmallow are all melted properly. The mixture at the end should be watery. Im trying to do this for 20pax. I want to use my 10" mould. If i double up the ingredients is it enough,or tripple it? Hope to hear frm u soon. Thank You. If you are doing it with a 10" mould, you can double the recipe. Remember that the jelly layer on top will melt if left outside of fridge. So try to put the portion that is not going to be eaten yet in the fridge. If you don't have whipping cream, you can replace all with milk. It is not a problem. Only thing is that it won't taste as rich as if you use whipping cream. Also you can increase the gelatine by 1 or 2 tsp. Hi thanks for sharing this recipe. How long do you freeze the marshmallow layer for before you add the strawberries? I had some foamy bits from the marshmallow layer when I added the jello. And I already cooled my jello completely before adding it to the marshmallow layer. Christine, I freeze the marshmallow layer until when my finger touches it and it feel slightly harden, like a skin layer has formed and not too wobbly, I can start placing the fruits on the marshmallow layer. Must be gentle when doing that, as you won't want to break the marshmallow layer. After adding fruits, place it back to freezer for maybe another 10-15 mins before you add the jello layer. Can I have your permission to post your recipe on my blog? Hi Juan, of course you are welcome to share my recipe on your blog as long as you quote the source of where you got it from. my friend made this cake for our gathering and it tasted fabulous! i wanna ask where do u get the gelatine powder from? and right, can i use marigold HL milk to replace e UHT milk? 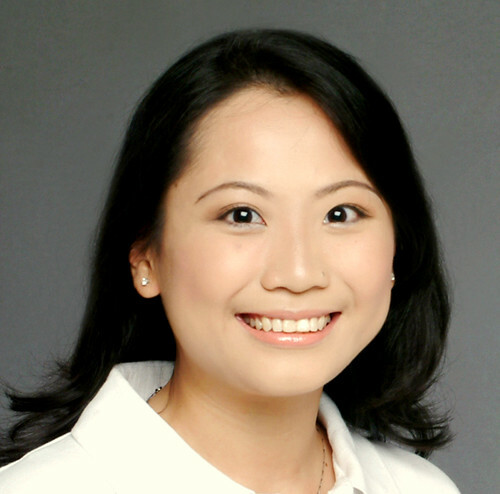 Hi Kimberly, I got my gelatine powder from Phoon Huat. You should be able to get it from any supermarket. No problem replacing the UHT milk with HL milk. hey. its me again, kimberly. i would like to ask about the whipped cream you were talking about. izzt the canned whipped cream or can i use e EMBORG UHT whipping cream? hi i have the same question as kimberly. isit the canned whipped cream or can i use EMBORG UHT whipping cream? will it be less sweet? You can use the canned whipped cream or Emborg Uht whipping cream. No problem. Hello! My friend made this exact same cake from your recipe and I have never forgotten about it ever since. What I would like to know is... what is the equivalent of 2tsp of Gelatin Powder in sheets? I can't seem to find Gelatin Powder in Cold Storage and have yet to go to Phoon Huat to buy it, so I bought Gelatin Sheets instead. How much do I use in place of the powder? hi Hugbear, this is the 2nd attempt of this cake. In term of taste, its better than the 1st attempt as i have reduced the amount of milk and mashmallow so that it is not too sweet. My parents like it more than the previous one. But one thing, the mashmallow level is too soft! i think i need to put more gelatin powder. And my jello does not stick to mashmallow level. Going for the 3rd attempt soon and i hope to perfect it! Wish me luck! Hi Anonymous, thanks for letting me know of the outcome of your Marshmallow cake. Yes, by all means modify the recipe to suit your taste. A little bit more gelatine would help in making it more firm. hi i am really glad i found this website!gonna be a filial son and bake for my mum's bday!thank you very much! Hi anonymous, hope you have great success in your attempt. Do share with us how it turn out ok. I have try making this cake and it turns out very nice and it tastes great too. Thank you for sharing it out. But the problem now is the cake will melt when we leave it outside? no way to keep it longer as in we will be bringing it out and will be eating it in 2hrs time? Hi Hugbear... do you think its possible to add some cream cheese into the filling layer? just a thought.. im gonna make one soon.. hehe..
Hi Markshu, I am sure you can add some cream cheese into the mixture. In fact, Yochana (find her blog under Lucy's Kitchen) has a recipe on this using cream cheese I think. Yes Sanrio3138, you can definitely use the Bulla Pure Cream. i am so sad ! i tried to make the cake just now . appearance wise , was really nice . but the marshmallow layer tastes like mushroom soup ! Could the reason be i used unsweetened whip cream ? Huh? taste like mushroom soup. So it did not set and it taste saltish? Then maybe you can add a bit of sugar to make it sweet. it did set . very nicely . here are hhe list of ingredients i used . marshmallows,uht milk,gelatine powder,and unsweetened whip cream . May I know which digestive biscuit brand do you normally use? Is it possible to substitute with cream cracker instead? Thanks a million for your great recipe! Hi..i tried making this today...hit with some problems like most people ...the jello did not stick to the marshmellow layer...unlikely to be due to the pouring of the jello only when marshmellow layer is frozen as i still had jello sipping thru it..wat is the likely cause ? I had problems removing the cake. i used a springfoam cake tin and when i removed the lock, the pressure caused the cake to break..any tips to resolve this ? my hubby feedback that the jello was a bit bland..can we add some sugar to it ? All the freezing is in the freezer in this recipe but when I have poured the jello, I put it in the fridge and not the freezer. Anonymous, no, don't use non-diary whipping cream. You can replace with agar agar but you will need to find the equivalent of it as I have not tried with agar agar I cannot advise you how much to use. Hi there, I chanced upon your receipe and I tried the receipe before. I was wondering for the 200ml of whip cream is a type of cream. Must we whip the cream woth a mixer ? My strawberries floated upwards too. How do I resolve it ? Hi! Sorry if my question souds stupid..The whipping cream in the recipe, do we use it in the liquid form or beat till its solid? Can I replace the milk with strawberry milk? Hope you can reply soon! Thanks! Hi Gorilla, the whipping cream should be in the liquid state. Yes of course you can replace with strawberry milk, your marshmallow layer will be pink colour in this case. Hi Hugbear! I made it! I reduced e amt of marshmallow coz the strawberry milk was quite sweet! Taste nice and the colour is great! Thanks for your reply! how many marshmallows are about 150 gms? Depends on the size of the marshmallows. If you are using the big size one, then you most probably can use about 10 to 15 pcs (but may be more than 150g but it doesn't matter). hi there, I tried this last night. It didn't cross my mind that the marshmallow filling will be hot and when poured into the biscuit tin, the heat melted the butter causing the filling to sip through. now my biscuit layer is a little chewy but still great! i use the same quantity as stated but dun seem to turn out like your picture, in terms of depth. Hi Baking Mum, can I know where can I get the whip cream from? Hi Baking Mum, I have finally tried making this cake....it's successful and yummy. My two girls just love it. Thanks for sharing your receipes...Can I ask u the exact address to get the Pandan Paste the one u strongly recommend- Where is this Sun Lik or do u have the contact number. I can't wait to try your Pandan Cake II receipe. Emily, well done on your marshmallow cake. You can try getting the pandan paste from Sheng Siong too. But here is the address of Sun Lik. Tried this recipe and my 3 kids loved it so much. First try it turn out well, but it was not high enough like a standard cake size and was small. why is that so? Second try, i think i did not wait for the base to be harden and pour the marshmallow in and everything become soggy. Hi Baking Mum, I have tried this receipe, the first try was successful, however the third time i make it turn out to be a disaster, there seem to be 2 layers form in the marshmallow part- the top is foamy and very soft and the lower part is ok...may i know what have I done wrong. When I add the gelatine powder to the milk should I stir to ensure the gelatine is well mix and not lumpy before I bring it over the fire. Do I need to cool the marshmallow before pour over the biscuit? Hi Baking Mum, appreciate if you could advise on the queries I post yesterday.....THANKS! EK, I am not too sure what went wrong. Maybe you need to stir the mixture gently so that it will not cause too much bubbles and foam during cooking. You can bloom the gelatine with some of the milk first before adding it to the marshmallow to cook. Blooming means you sprinkle the gelatine onto some of the milk and let it sit without stirring for 5 to 10 mins for it to be absorbed into the liquid. EK one more answer on the cooling down of the marshmallow before pouring onto the biscuit layer. You can cool it down a little before pouring. Can i use strawberry Jello instead of Rasberry Jello? Gracie, of course you can. yr cake looks LOVELY but i didnt achieve yr success. yr jello was prefect. mine looked a little cloudy. i freeze the marshmellow part for 1hr. poured in jello n it seeped thru my spring form tin. still in fridge, hv not cut to see x-section. any difference between whipping cream n top whip? thanks for e wonderful recipe. just a simple question, which i hope it doesn't sound too stupid, but when u say melted butter for the base, does it mean u just leave the butter to soften at room temperature or we use low heat to melt it? thanks alot..
thanks for sharing the recipe .. whether there tipsnya to make them look good as you make? Thanks for the recipe. Attempted it last nite. Tastes great except I didn't wait long enough for the marshmallow layer to harden more. Used strawberries and kiwi. Will definitely try again. Thanks for the wonderful recipe. I've few questions to trouble you, hope you don't mind answering them. 1. Have I got to freeze the biscuit base or just set it in the fridge for few hours? 2. How long does it take for the marshmallow to set before pouring in the Jello mixture? 3. 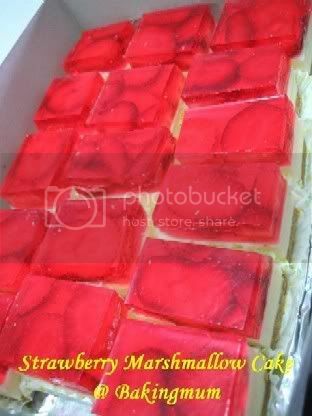 Both marshmallow and jello mixutre got to be slightly cooled before adding onto each layer? 1. Either the freezer or fridge is fine. 2. Put it in the fridge to let at least the surface harden. No need to wait for the whole marshmallow layers to harden. 3. Yes got to be slightly cooled, not too hot. Hi, as i would be making this cake for a friend's birthday and the cake would be in a air conditioning room, will the jello still melt? and if i replace it with the agar agar would it be a better choice as the cake would be out of the fridge for a few hours. Thanks. Hi Sweetylicious, I use a cake ring so that you can remove this cake nicely. Hi Zhaoyue, yes you can replace with agar agar as jello will melt at room temperature if left out for too long.